Offering you a complete choice of products which include how to analyse married life books, matching for marriage books, grahsth jeevan mein graho ke prabhav, analysis of marriage through astrology, your star & married-life and vaivahik vilamb ke vividh aayam books. Guidelines to spot prominent events in life,planetary configurations for marital happiness and discord, astral remedies for solving marital Solutions,special reference to most malefic influence, case studies. In this book the author has explained not only the rules for various koota agreements, but also given various expections for rules which are either not known to the majority or not applied in practice by the majority. We offer Grahsth Jeevan Mein Graho Ke Prabhav to our clients. The subject of the book is marriage. 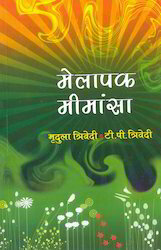 At present, the numbers of domestic violence and conjugal disturbance are increasing day by day which attracted the attention of the Author to study the matter seriously. He took the marriage as the subject for his dissertation paper in M.A. examination and did much research work on it. 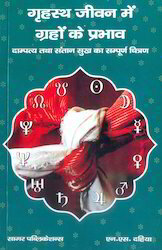 This research works has been compiled in the form of a book which is named as "Analysis of Marriage through Astrology" It contains the principles of astrology and significations of planets, rashis, bhavas, nakshtras etc., in the first few chapters. Thereafter combinations of marriage, conditions for controlled life in man and woman, loose characters, number of marriage, late marriage, unmarried etc, have been dwelt upon. Mangal Dosh has been dealt with elaborately because wrong conception about it has been propagated in the society causing a great Solution to the parents of the bride and the groom, A new approach in the matter of Marriage match-making has been given separately in a very scientific way. A chapter on the children (Santan) i.e. begetting of child, pleasure from the child etc has been given. A separate chapter has been given on the muhurta of marriage which is very important but is seldom followed by the pundits and priests seriously and meticulously. 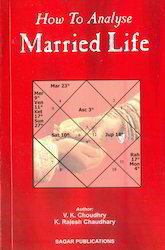 A separate chapter, horary marriage, has been added for those who do not have their detailed birth data. A chapter on the longevities of bride and groom has been added. Many methods have been given for calculation of longevity but a complete new idea, concept and methods of calculation of longevity on the basis of the bhogya nakshatras of lagna, 3rd bhava centre, and 8th bhava centre, Sun, Moon and Saturn have been given. It is worth reading. 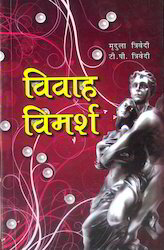 We offer Vaivahik Vilamb Ke Vividh Aayam Books to our clients. We offer Kaun Manglik Nahi to our clients. 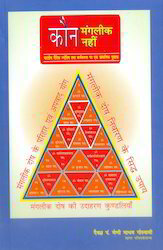 We offer Phalit Jyotish Ke Teen Stambh to our clients. Each part of the zodiac is a solar mansion better called as sign or raashi. This book revolves around the 7th house of the zodiac and the predictions and views stated regarding various astrological combinations in all the 15 chapters of this book, are solely on the basis of personal study and research of the author. 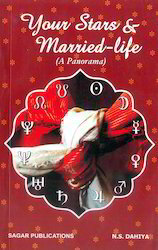 This book deals with the literary references about marriage chronologically, right from vedic period , all parameters pertaining to marriage are centring the 7th house of kaalpurusha which is sign Libra and the 7th house of horoscope as counted from pivotal points as lagna, moon sign, navamsa lagna. Explanation of Sun’s debilitation in libra and Saturn’s exaltation in libra and their mutual underlying partnership is put forth. 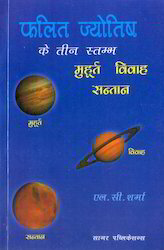 Then there is stress on understanding Venus with all it’s signification, association and aspects with other planets, the indepth analysis about 7th house is made through discussion of various facets of 7th house such as the signification of 7th house as given in texts and author’s personal opinion about 7th house while relating the concepts of Siva and Sakthi, Purusha and Prakriti and Beejam and Kshetram to lagna and 7th house. 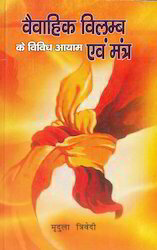 Further this book deals with similarity of Indian concept of Ardhanaarishwara and the western ‘Theory of shadow’ by C.G. Jung. 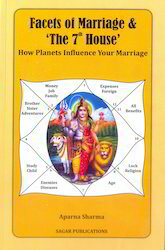 Then the role of 7th house in marriage is analysed through Jaimini system of astrology. 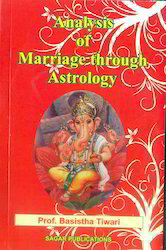 So far as research based analysis of more than 400 horoscopes is there, Role & effect of all the planets in marital matters is referred to from important texts and books and author’s opinion further explains all points from grass root level which bring out the effect of planetary placement in 7th house, connection with 7th lord from all angles, and retrograde planets giving a tryst to marital matters. 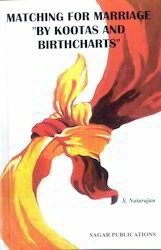 This book also highlights the navamsa connection in marriage, the theory of ‘yin yang’ energy balance in oneself through the individual horoscope and the techniques to determine the relationship potential in the individual natal chart from new perspectives. The marital associations are described through understanding of the quality, elements of signs on 1/7 axis, and male/female signs of the significator planets. There is a brief analysis regarding, Promise of marriage, Combinations of delays /denial of marriage and Timing of marriage done through various technics. In the end there are given Remedial measures to improve the future prospects of marital relationship. 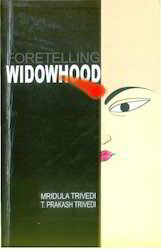 We offer Foretelling Widowhood to our clients. We offer Vivah Vimarsh to our clients. 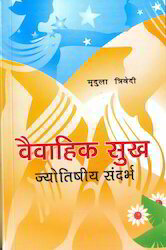 We offer Vaivahik Sukh Books to our clients.